Condoms have come a long way from the early days where they were made from sheep intestines or bladders. During the Industrial Revolution, Charles Goodyear, a self-taught American chemist, developed the process for vulcanizing rubber (for which he was granted U.S. Patent No. 3,633 in 1844). This process, where natural rubber and sulfur or other additives are heated together to derive a more durable material with a higher elasticity and tensile strength, was pivotal in the evolution of condoms. By 1860, condoms were being produced on a large scale. In the 1920s, latex, formed when rubber is dispersed in water, was invented. This breakthrough revolutionized condoms, making them, in large part, what they are today. As time marches on though, condom manufacturers continue to look for the next best thing in terms of materials from which to make their product. Perhaps that might be polyisoprene? Recently, patents in multiple countries were granted for synthetic polyisoprene latex gloves and condoms to Ansell Healthcare Products LLC (referred to here collectively with related companies as “Ansell”). 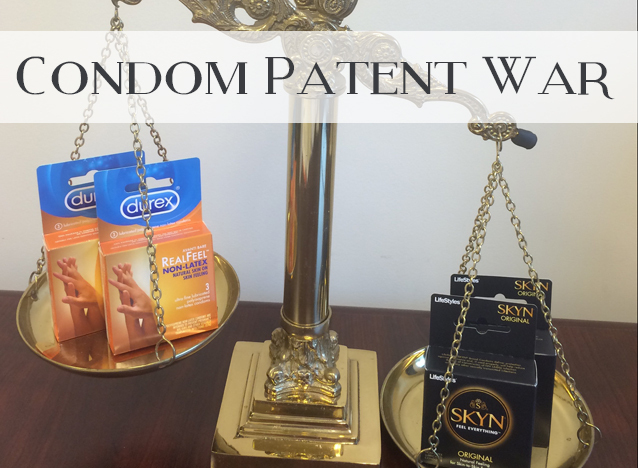 Ansell sells a line of synthetic polyisoprene non-latex condoms, presumably covered by the patents, under the brand name, SKYN®. Reckitt Benckiser Healthcare (UK) Ltd and related companies (collectively referred to here as Reckitt Benckiser) distribute the Durex RealFeel® condoms, which are advertised as made from polyisoprene. This has led to what has become an all out patent war with three battles being waged currently. Ansell filed a first patent infringement suit against Reckitt Benckiser in Australia in November 2014. A decision from the Australian Court is expected later this year, according to a press release issued by Ansell. U.S. Patent No. 9,074,029 issued July 7, 2015. In the U.S. case, Ansell is requesting an injunction (an order for Reckitt Benckiser to stop selling the RealFeel condoms), as well as damages, court costs, attorney fees, and interest. The case is in its early stages. On the date of publication of this article, the most recent development was the holding of a “Markman hearing” on March 1, 2017. A Markman hearing is a pretrial hearing in a U.S. District Court (federal trial court) during which a judge reviews evidence from the parties relating to the appropriate meanings of relevant key words used in a patent claim in a patent infringement case. This is to determine appropriate claim construction, i.e. claim interpretation. To learn more about claim construction, take a look at another article on the blog titled: Maker of Cialis Accused of Patent Infringement. In the newly-filed UK case, Ansell is alleging Reckitt Benckiser is infringing on European Patent (UK) number 2,280,618, having the same title as the U.S. patents. According to the press release linked to above, Ansell will seek monetary damages, as well as an injunction to stop Reckitt Benckiser from selling in or importing into the UK the RealFeel condoms. For a company to be guilty of patent infringement, the company’s product must include each and every element of a claim in a third party’s patent. Accordingly, Ansell will have to prove that Reckitt Benckiser’s ReelFeel condom includes each and every element of the claims of Ansell’s patents. The outcome of the cases in each country will determine the rights and obligations of each party in that country. For example, the court’s decision in the case in Australia will be binding on the parties in Australia, but not in the U.S. or the U.K. There is no such thing as a worldwide patent, so patent battles are fought on a country by country basis. The condom market is a BIG business. A 2016 report by Research and Markets predicts the worldwide condom market to reach approximately US $9.6 billion with a CAGR of more than 8.2% till 2021. Size matters – When there’s that much at stake, litigation is bound to ensue. Such a well written article. Informative, and easy to read. With well placed word play for a mood lightner . With so much at stake, you should be treated to a nice steak !